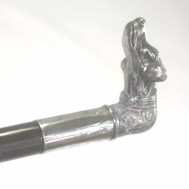 This is a beautifully designed cane of the Victorian period. Silver plated cast metal, mounted on a re polished Palmira shaft with base metal ferrule. 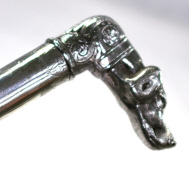 The silver plated cast holds a faint engraving of a shield hold the letters B.W.B. Lovely condition throughout free from breaks or damage.